Software quality factors are divided into external and internal criteria, which can be assessed by manual or automated methods to gain insight to the current output provided by developers or outsourcing providers. External factors such as defined features or security encompass the user experience when operating the program. Internal factors are typically code dependent, meaning they are not a visible end-user feature, but rather create vulnerabilities within the systems and infrastructure components used by a business. Software quality metrics can be used to evaluate both and determine what vulnerabilities or defects create potential threats to the security, performance, resiliency, or usability of an application. Does your development team spend too much time identifying problem sources and performing maintenance due to source code defects? Is overly complex code creating more work for developers as they make enhancements to an application? Software quality metrics provide the input organizations need to make important changes in application source code or development practices to boost resiliency, robustness, and security as programs are rapidly created or altered within a complex, multi-tier infrastructure. Function points are an advantageous software quality metric for evaluating source code because they break down an application into functional units based on end-user requirements. These units are used to generate an unadjusted function count, which is then adjusted based on their complexity level. The adjusted count is then combined with specific metric analysis practices to provide a software quality benchmark, which can be used to assess productivity, complexity, risk, and additional characteristics for each developed program. CAST Application Intelligence Platform (AIP) is the only enterprise solution capable of assessing multiple languages and technologies across a complex, multi-tier infrastructure. It utilizes system-level software analysis and industry standard best practices to produce actionable measurements for achieving your software quality goals. As applications are created or enhanced, CAST AIP may be used to obtain new software quality scores to ensure quality and early defect identification. It is a powerful automated solution for effectively managing software quality issues and making informed decisions to ensure development project success. 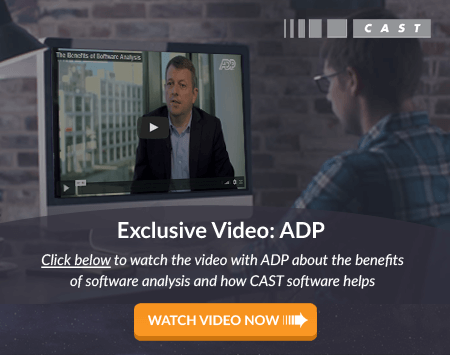 Click here to learn more about what your organization can achieve with CAST AIP.